Over half the European population of Stock Dove is found in the UK. In Scotland the highest breeding densities are in the central belt of Lothian, Clyde, and Ayrshire, and in Fife and Buchan. Stock Dove are predominantly found in low-lying mixed farmland with some woodland. They normally nest in holes in trees but will exploit nest boxes, and sea cliffs. This species is largely under-recorded in Scotland, and there are significant gaps in our knowledge, such as the population size and trend. The last record of Stock Dove on Arran was in June 1989, a long time ago. I suspect that this attractive bird is overlooked by many people who dismiss it as 'just a pigeon'. At first glance the Stock Dove looks like a small Wood Pigeon, but the Stock Dove does not have a white patch on the neck. The Stock Dove is about the same size as a Rock Dove, but unlike Rock Doves they do not have pale rumps. 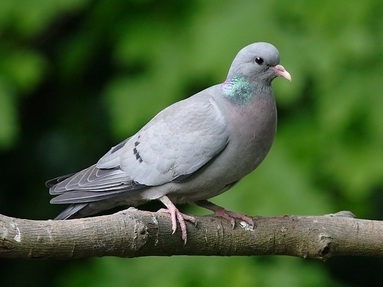 Stock Doves are largely blue-grey with a pinkish breast and an attractive iridescent bottle green band on the back of the neck. In flight they show a diagnostic broad black border around most of the wings. Another differentiating feature is their black eyes. The bill is yellowish and the legs are pink. They have a black tipped tail and two small black wing-bars on each wing, which are less distinct than the wing-bars on a Rock Dove. Juveniles are duller and lack the iridescent green neck patch. Like all pigeons, Stock Doves have a well-developed crop: a sac inside the throat where food can be stored before it is digested. This enables the bird to gather plenty of seeds quickly, before retreating to a safe place where the food can be digested properly. If you do see Stock Doves, please take a moment to report the sighting to me, so our records can be as comprehensive as possible.